The northern border of the inlet to Roberts Bay is a favorite fishing and beach spot for people from Venice and nearby communities. Across the inlet to Roberts Bay from the South Jetty and Higel Marine Park is the North Jetty, in Nokomis, Florida (map). 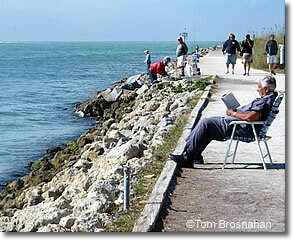 Like the South Jetty, it's a favorite place to come for fishing, sunning, picnicking, strolling and spectacular sunsets. North Jetty is at the southern end of Nokomis Beach, which has good beach facilities, including toilets, showers, picnic tables, benches and parking lot. To get to North Jetty, drive north from Venice on the Tamiami Trail (US 41) to Albee Road and turn left (west) to reach Casey Key, the island on which you'll find North Jetty (map). Follow the road to Casey Key until you must turn left or right, and turn left (south). This will take you past the Nokomis Beach facilities to the parking lot and facilities at North Jetty. enjoying the sun on North Jetty.